Delicious and authentic Piadine, perfect for a quick lunch or take away dinner. What's a Piadina you ask? Well, it's like a flat bread, but comes from a specific region of Italy (Emilia-Romagna). These delicious flatbreads can be filled with any number of delectable combinations. My favorite is the veggie if you want to be healthy, and the caramelized fig and cheese if you don't! Part of Florence's new cosmopolitan food scene, this hip yet quaint bar/cocktail lounge/restaurant/flower shop is a must see in Florence. You can read more about La Menagere here. A modern take on Tuscan cuisine and home of the best vegan lasagna I have ever had! But don't worry, they serve lots of meat dishes along side their large selection of vegan and vegetarian options. You can read more about Konnubio here. This traditional, yet modern, Tuscan restaurant is the perfect place to splurge on the famous bistecca Fiorintina and a nice bottle of Brunello wine. It is elegant but not stuck-up, and the wait staff is helpful and friendly. They also do a white bean bruschetta that will blow your mind! Everything in this "fast food" restaurant is vegan! Even the delicious desserts! They offer a wide selection of healthy options, perfect for when you need a break from the bistecca. A true Tuscan hole-in-the-wall, Il Giova is one of my absolute favorite places to eat in Florence. In fact my coworkers and I eat there almost everyday for lunch. The hand-written menu changes daily, but everything is always delicious. And at 5 euros for a first course at lunch, you cannot beat the prices. But be warned, there is no English menu. Soul Kitchen serves a great and large aperitivo daily. Perfect for summer evenings when it is too hot for a big dinner. Aperitivi, or buffets, are also a great way to try new dishes with no commitment. You simply pay for the drink and enjoy the unlimited buffet of Italian delights. I only recently found this adorable bar and grill. Fusing Italian and international cuisines from barbecue to tapas, Gecko is a great escape when you are tired of eating all the Italian food. Make sure you say hi to their adorable mascot Winston the bull dog. Cinque e Cinque is the cutest little vegetarian restaurant in town. Finding healthy food in Florence isn't always easy, but you can count on Cinque e Cinque to serve healthy yet flavorful dishes. Another bar that is a great spot for an aperitivo with friends. Rivalta even lets you take your drinks out to the river so you can enjoy the incredible view of the Ponte Vecchio while sipping wine and chatting with friends. They also offer a wide selection of cocktails. 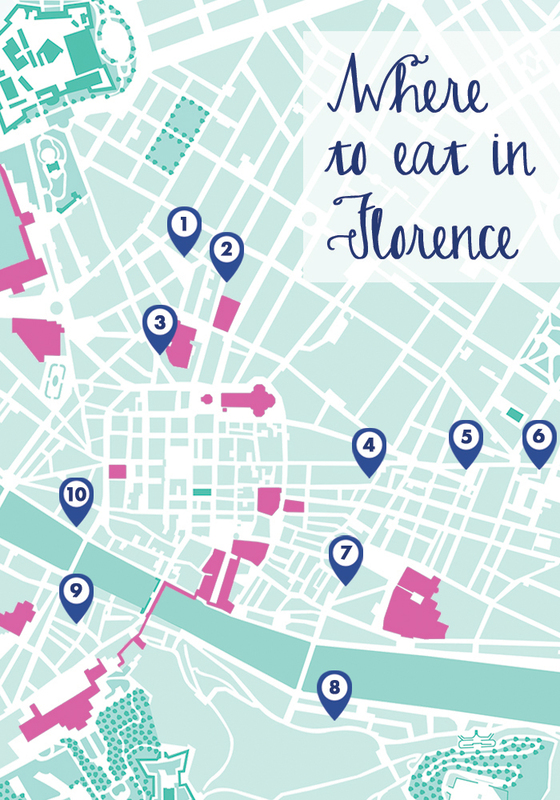 You can read part one of Where to Eat in Florence here.